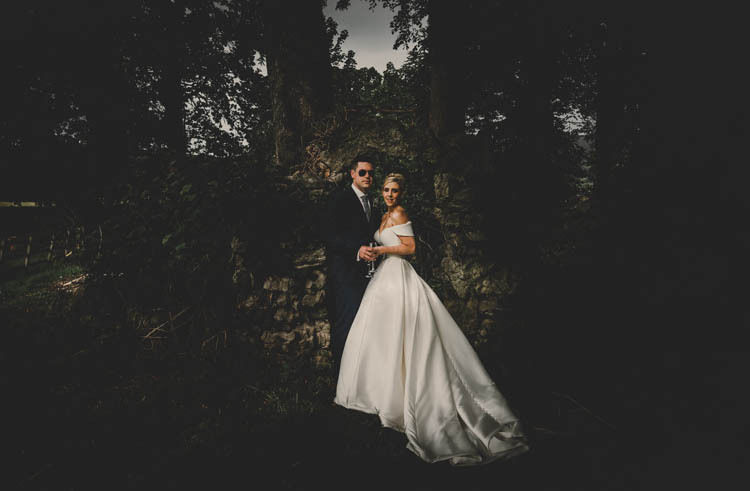 Kristy and Karl tied the knot in absolute style at Pentre Mawr Country House on 2nd August 2017. 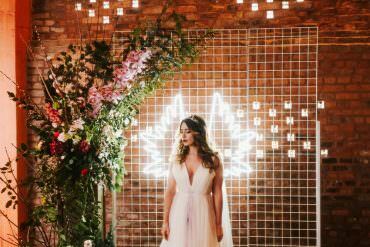 Think sequinned bridesmaids, gorgeous outdoors inside greenery, a bit of a band theme and all the light up signs and glamour to go with. 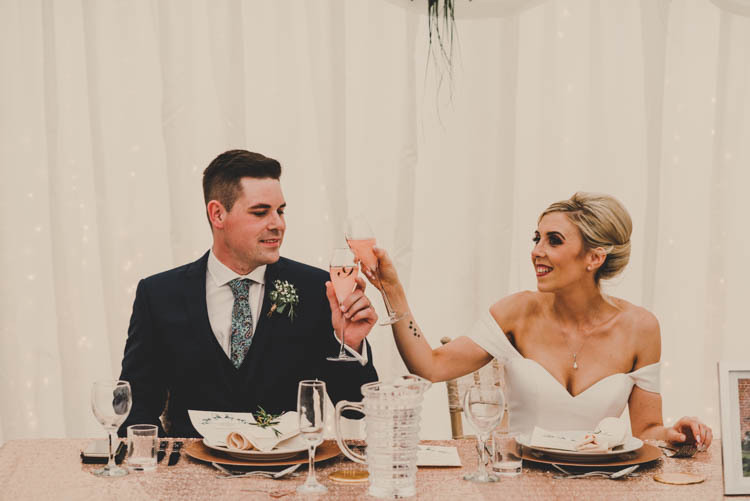 Their wedding was a positive extravaganza, three days of festivities complete with plenty of delicious food and drinks of course! I’m a huge fan of extending celebrations where possible and this sounds like the most fantastic few days. 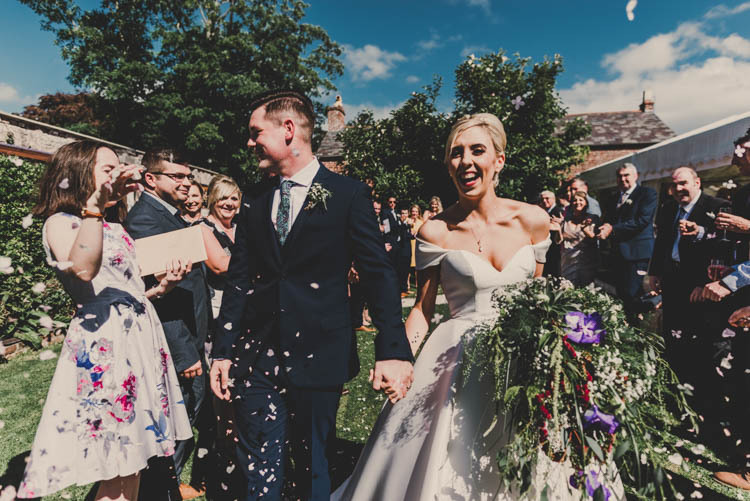 This couple did everything their own way and made sure the whole celebration reflected them as a couple. 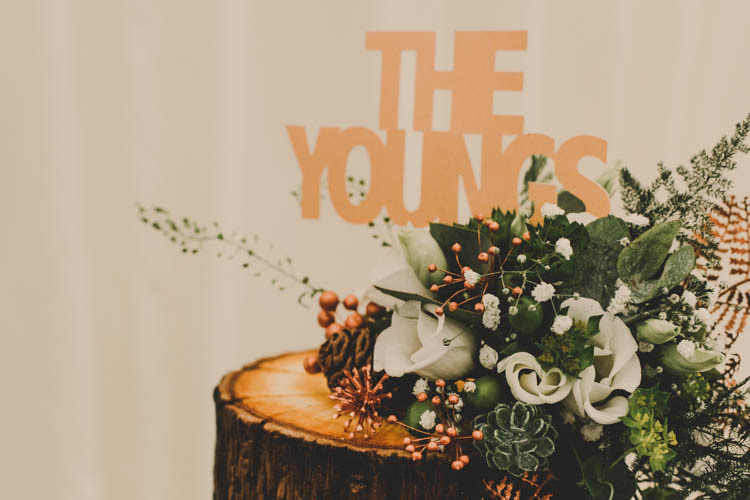 I love how they really went to town with the theme of ‘The Youngs’ and this was a thread that ran through the whole wedding day. Don’t you think that the combination of the glitz and glamour with the green outdoor setting works just perfectly? 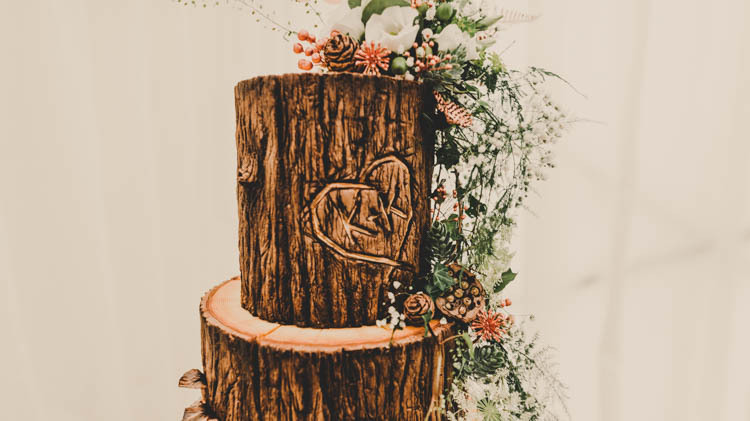 And how about that cake?! 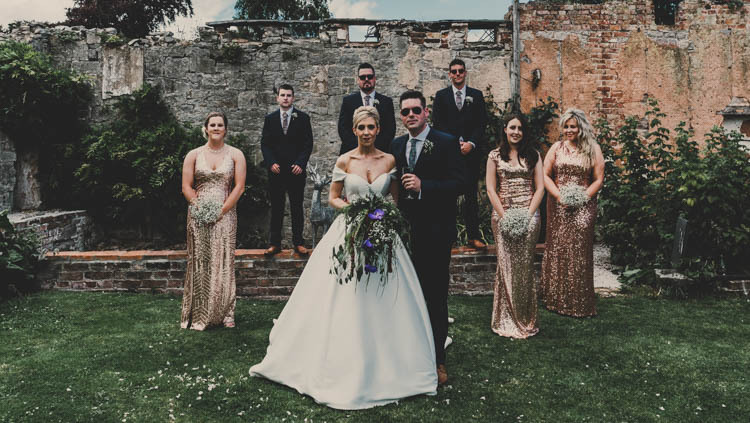 Kristy and Karl added even more glamour to proceedings with their fabulous outfits. 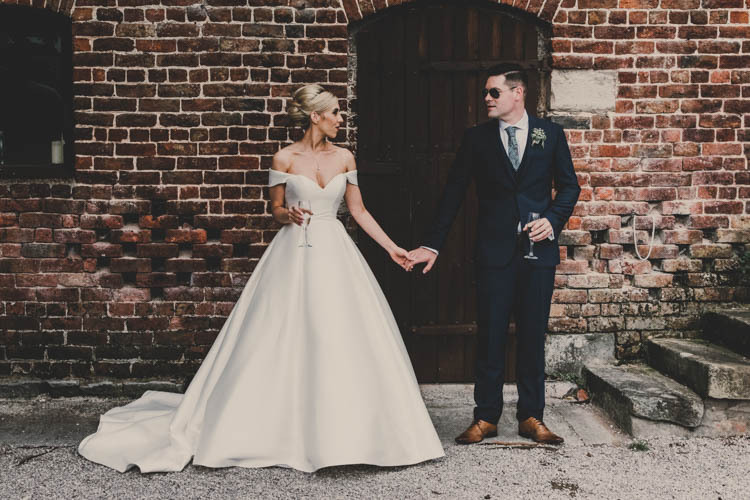 Kristy plumped for a fairly traditional shaped dress with a sweetheart neckline but had bardot style sleeves added, amazing! Meanwhile, mod at heart Karl looks ever so sharp in his Ted Baker suit. 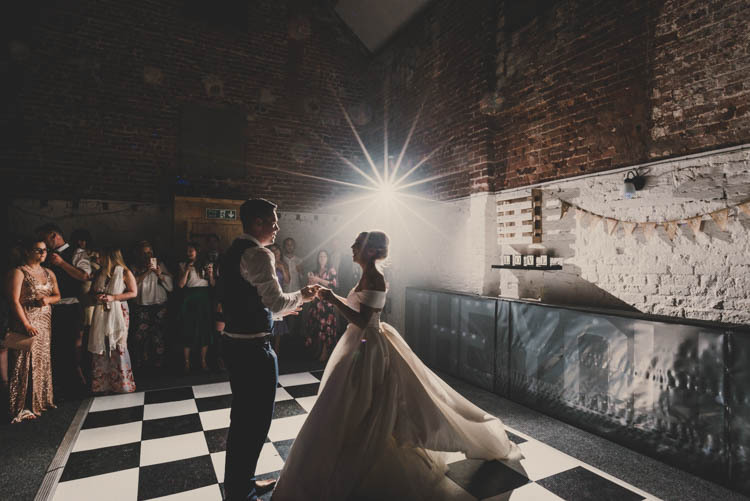 Photographer Jade Maguire has captured the atmosphere just perfectly. 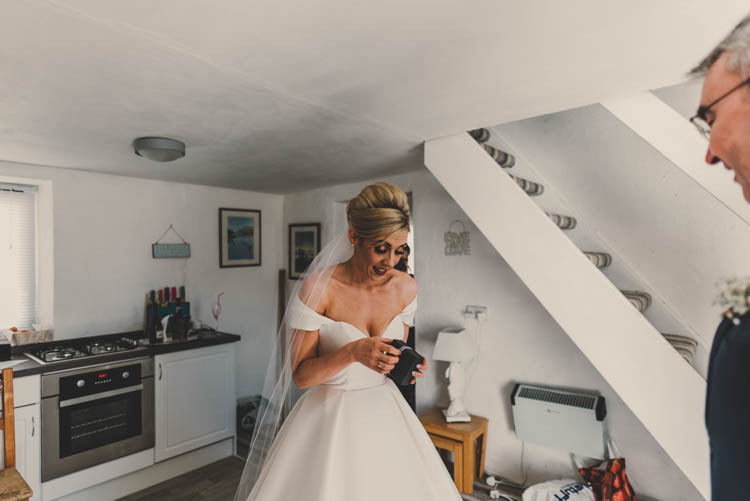 Thank you so much for sharing these brilliant images with us Jade. THE PROPOSAL | 29.07.15 – Walking along the beach after dinner on our first night on holiday in Greece. He got down on one knee and I cried! 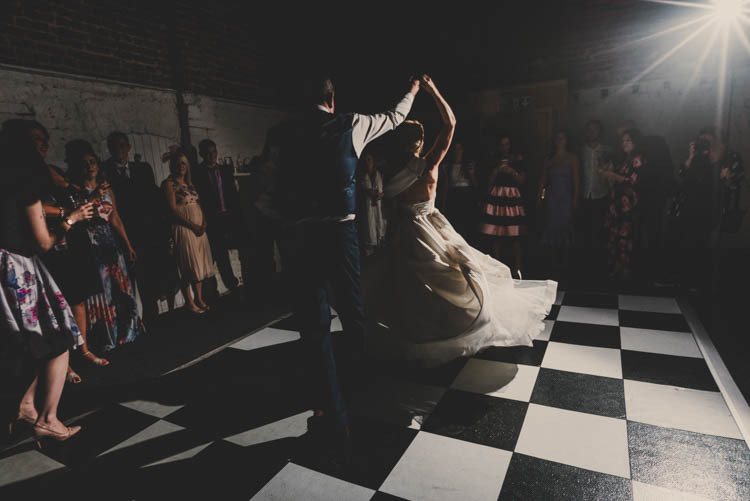 THE VISION | We wanted a wedding that was essentially one big party, and so we knew from the start we weren’t going to invite children. 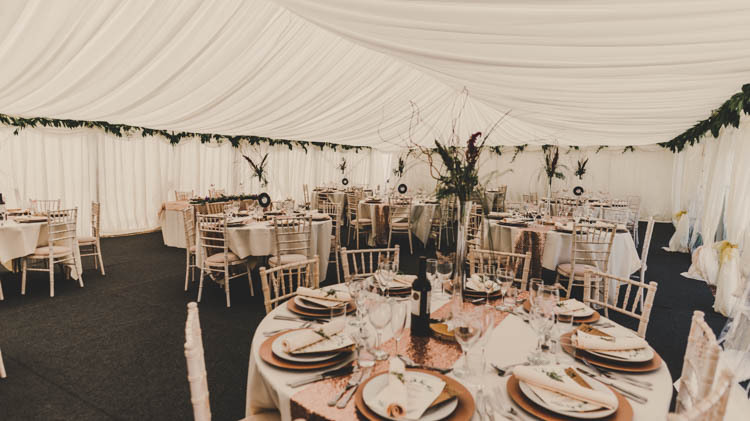 We also knew that we wanted a wedding that would take place over a few days with the options for guests to stay the night before and night of the wedding. Music is a big part of our lives and our relationship, so it was important that was a feature, as well as amazing food and plenty of booze! 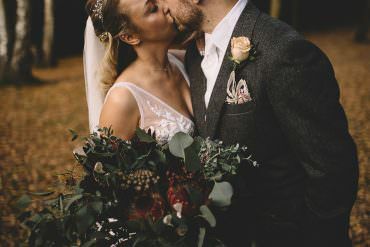 In terms of the “look” I wanted to maximise getting married outside in the Welsh countryside by having a natural, woodland, rustic look throughout in terms of flowers, but I also wanted a glam element. 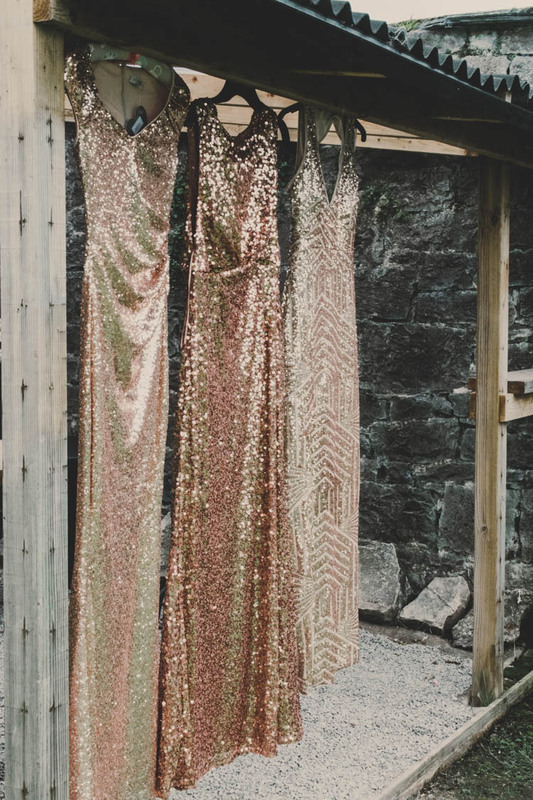 This evolved into a hybrid of rustic meets glam, and foliage meets rose gold… and lots of sequins! THE PLANNING PROCESS | When we got engaged in July 2015 we quickly decided to set a date for the summer of 2017. 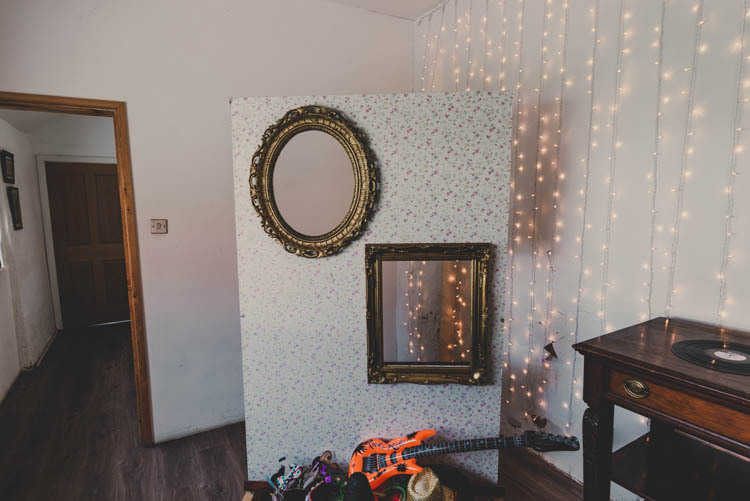 We were due to have our baby in January 2016 and decided to book the venue ASAP to secure the date and then have a planning ‘hiatus’ to focus on the pregnancy and our new-born. 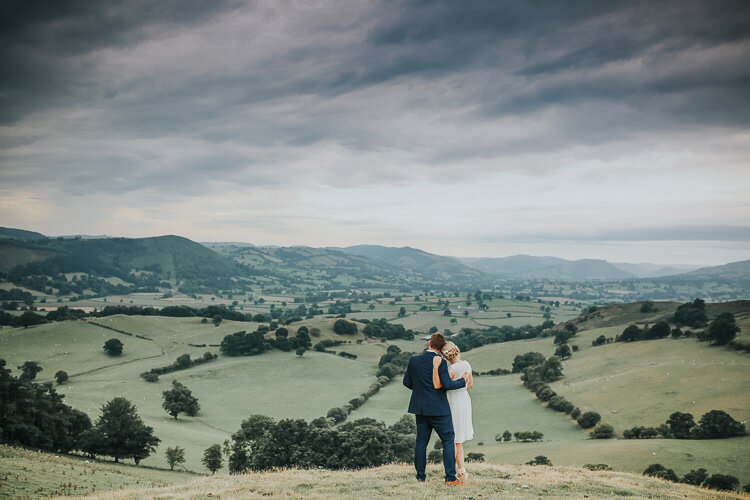 We decided early on we would get married near my home in North Wales, and we knew we wanted something a bit different. 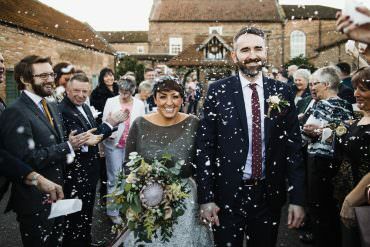 We aren’t religious so didn’t want a church wedding and wanted the ceremony and reception in the same place to avoid travelling and the option of guests staying over to really extend it. 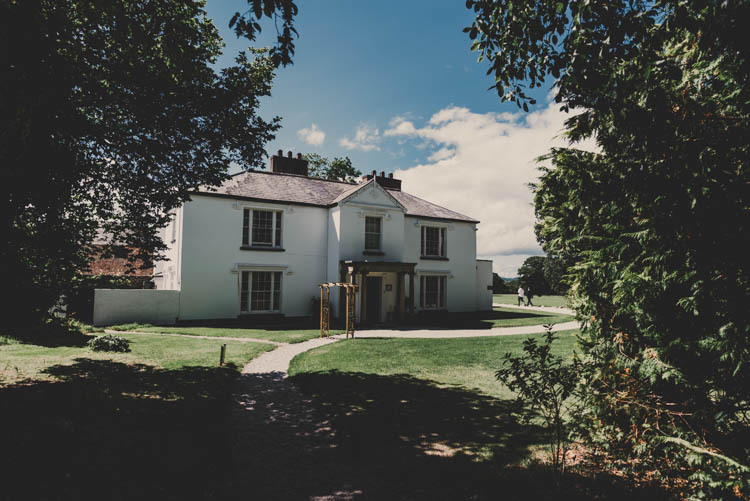 We booked several visits to venues in October half term of 2015, and Pentre Mawr was the second one we visited. 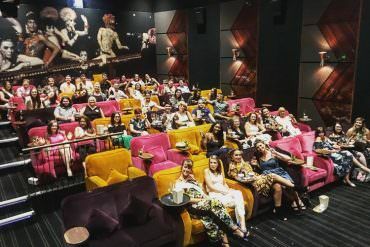 We instantly loved it and checked out one more before cancelling the rest and booking that week for August 2017. We also gave our notice and paid our registry fees. We then did very little in terms of planning until summer 2016 when our little boy was 6 months and we were a year away from the wedding. 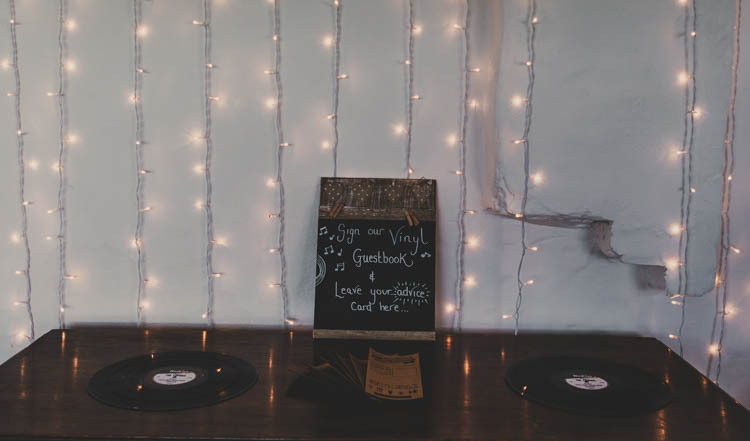 We spent the summer booking suppliers such as caterer/bar, photographer, and the band, and sent our Save the Dates out. 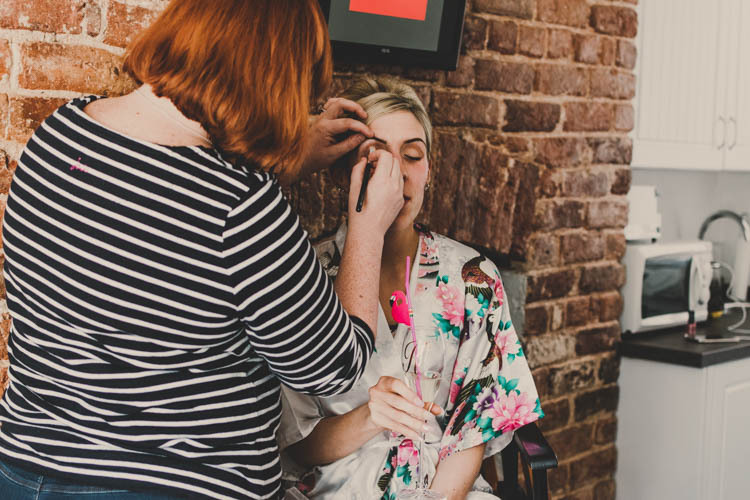 Over the next few months we started looking at details such as the choir, florist and cake maker. 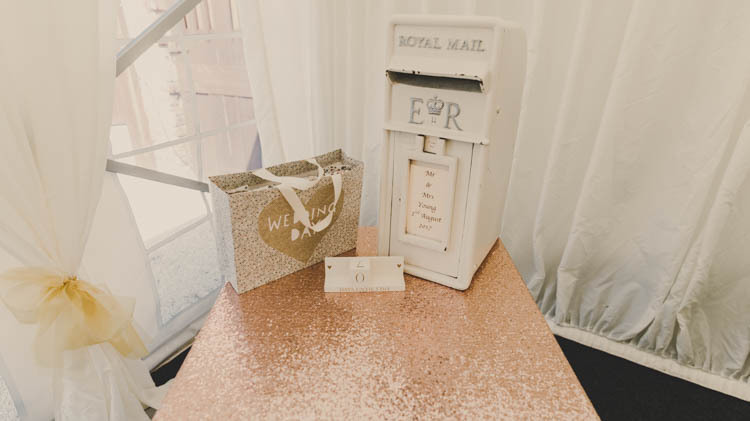 I began the search for my dress in January 2017 and we sent the invites out then as well – themed as gig tickets complete with ticket stub. We started searching for the bridesmaid dresses in February, but this took months. 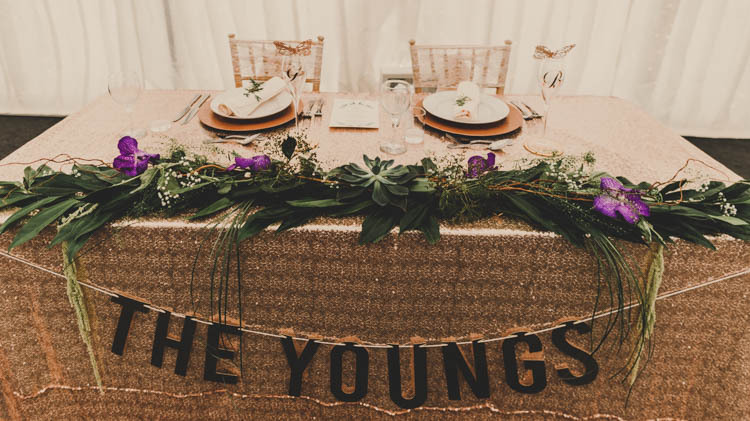 We had our hen and stag parties in April and then from May – August it was quite intense in terms of planning the detail as we did a lot of the décor ourselves… finding rose gold charger plates, an aisle runner, making the table numbers etc, and essentially getting the vision together. In the weeks leading up the focus was on the music playlists, the seating plan and finalising details with suppliers. 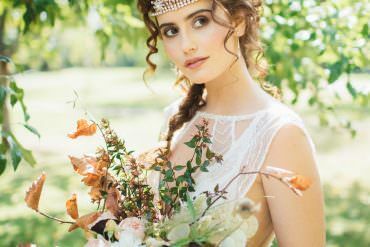 BUDGET | Started at around £15-20k all in including honeymoon and dress. Ended up costing closer to £30k. 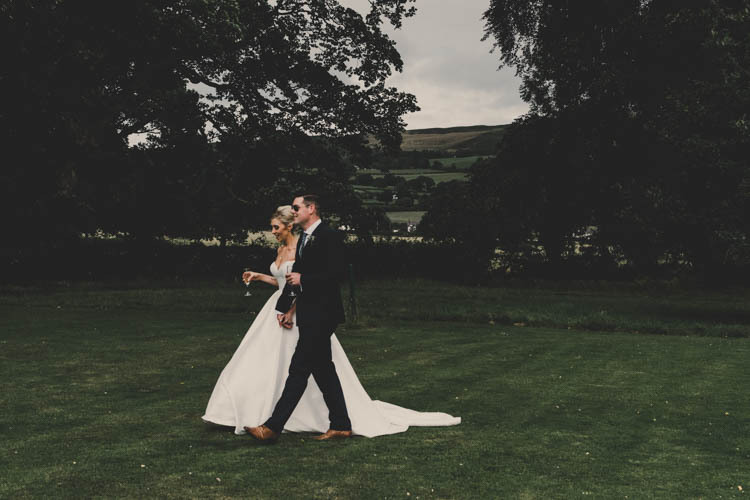 THE VENUE | Pentre Mawr Country House, Denbigh. 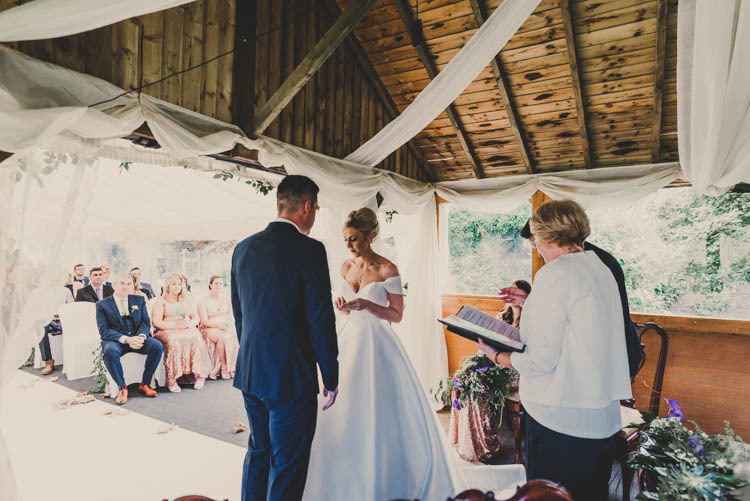 A 16th Century Manor House where you get married in The Secret Garden, have photos overlooking the Welsh Countryside, dance the night away in their huge Barn and stay in African themed safari lodges complete with their very own hot tub! 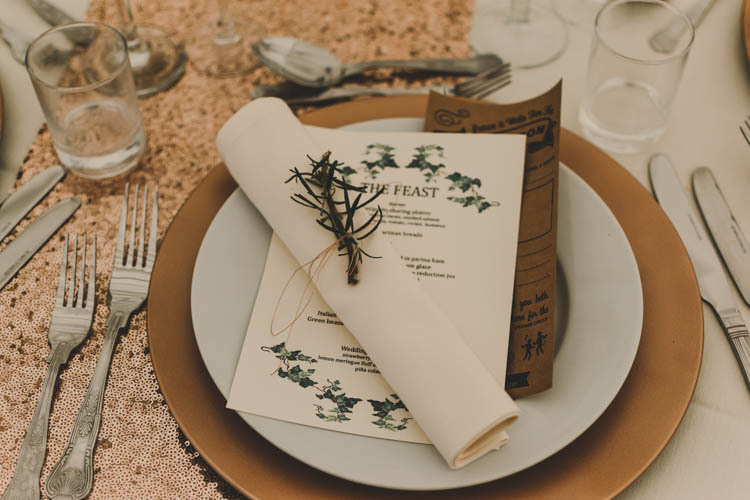 Bre and Graham really do make their home your home for the wedding. They do two weddings a week as they do not want to be a wedding factory, so we were able to start setting up on the Monday (wedding on the Wednesday) and Karl and I stayed a third night for free so didn’t leave until the Friday. Their motto is “So long as it’s legal”! 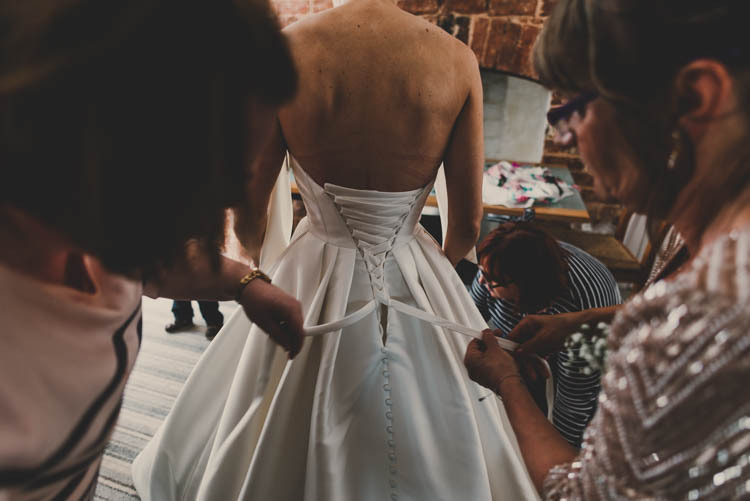 THE DRESS & ACCESSORIES | I chose a simple, plain ivory but classic, timeless ballgown with a train, and I had a seamstress add a Bardot/off the shoulder neckline. 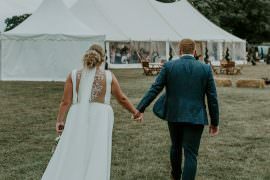 I paired it with a cathedral length plain veil, pearl necklace and earrings and rose gold glitter Betsey Johnson heels. I wanted a classic but glam look so had a classic up-do and vampy make-up complete with rose gold glitter eyeshadow and plum lips. FINDING THE DRESS | Started looking in January 2017 – booked approximately six boutiques over one weekend. My dress was about the fourth dress I tried on at the second boutique (about the 12th in total). Tried a few more on to be sure, but I knew I had the one. Cancelled all the other appointments and went back and paid the deposit that day. 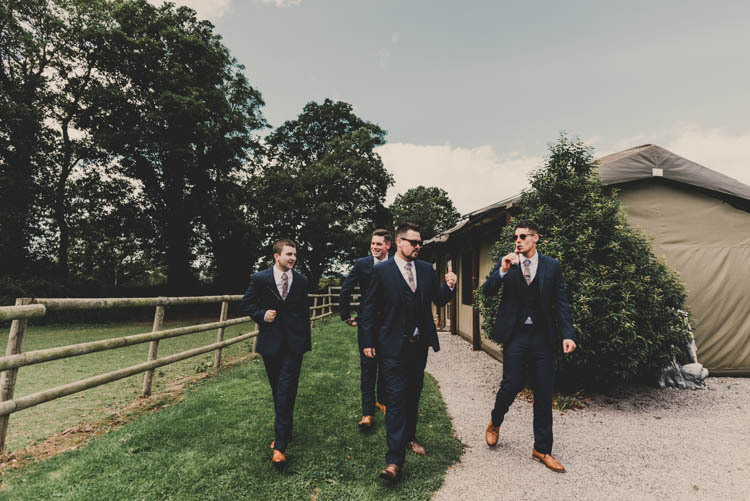 GROOM’S ATTIRE | My husband is a mod at heart and so wore a slim fitting, midnight blue Ted Baker suit with a waistcoat and a light blue paisley tie. No top hats and tails here. The Groomsmen were in matching suits but had pink paisley ties. They all wore Pretty Green paisley socks. 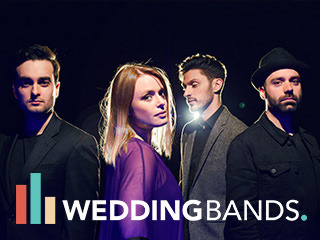 THE READINGS & MUSIC | There were no readings, but we wrote our own ceremony and vows. It was informal, laid back, and told the story of us. 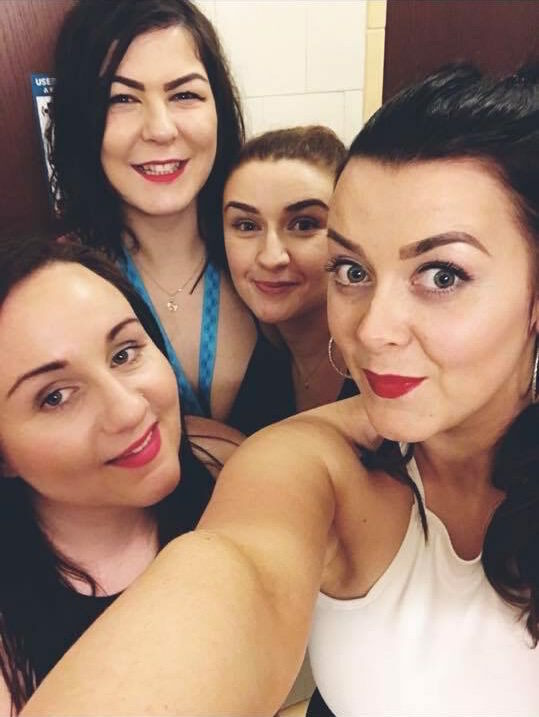 We had a barbershop choir called The Clwyd Clippers sing as guests arrived and then we paid for them to buy the rights to two Courteeners songs (a Manchester indie band). I walked down the aisle to them singing “Last of the Ladies” and we walked back up the aisle as a married couple to “Take Over the World”. 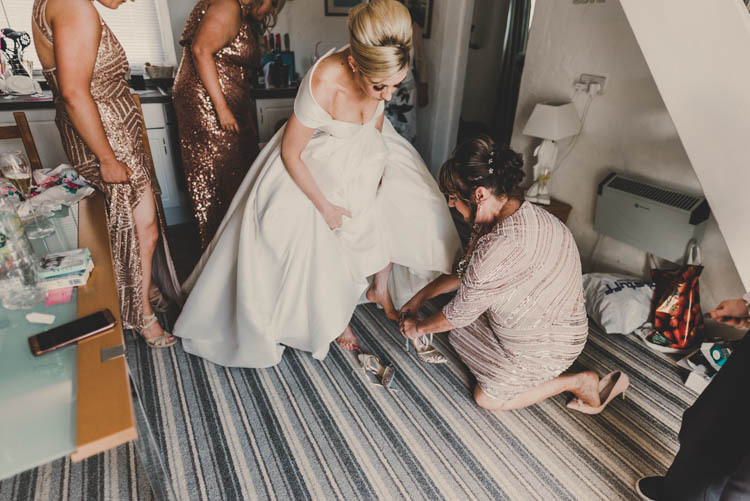 Whilst signing the register we had The Specials “Too Much Too Young” playing simply for the line “You’re married with a son when you should be having fun with me!”. 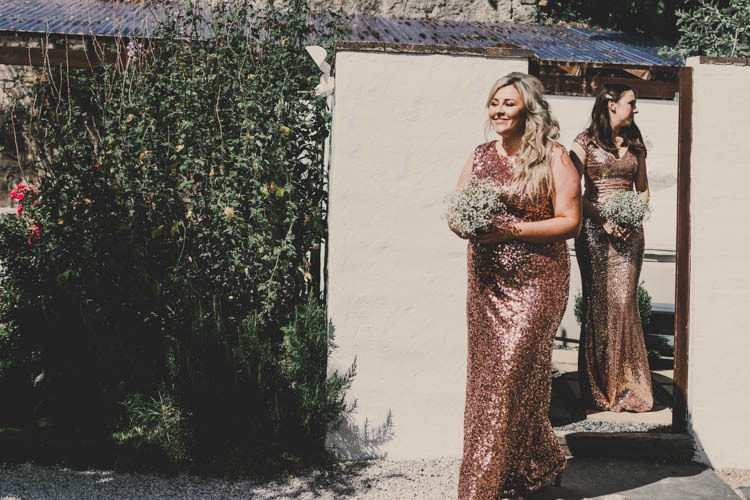 BEAUTIFUL BRIDESMAIDS | My three bridesmaids (cousin, sister-in-law and my sister (Maid of Honour)) were in a mix ‘n’ match rose gold sequin cocktail dresses. 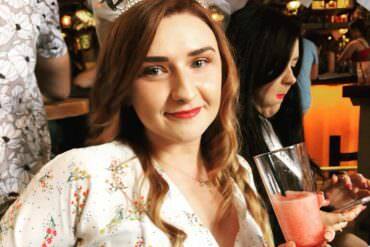 They were all from different places (Quiz, Jenny Packham, Goddiva) and were chosen by the girls. They had their hair and make-up done professionally but had complete choice over how they wanted them. 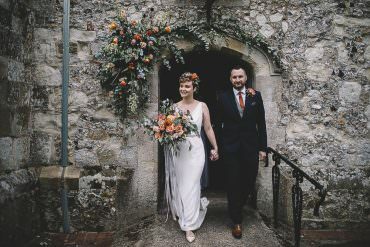 THE FLOWERS | The majority of the flowers were simple gypsophila with a huge swathe of foliage everywhere to give the “outside-inside” feel and continue the theme of getting married outside in summer. 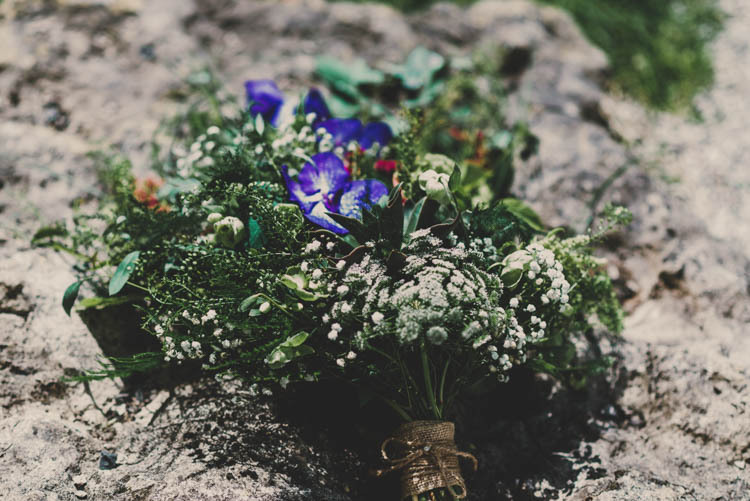 My bouquet was a rustic, cascading bouquet of wildflowers. 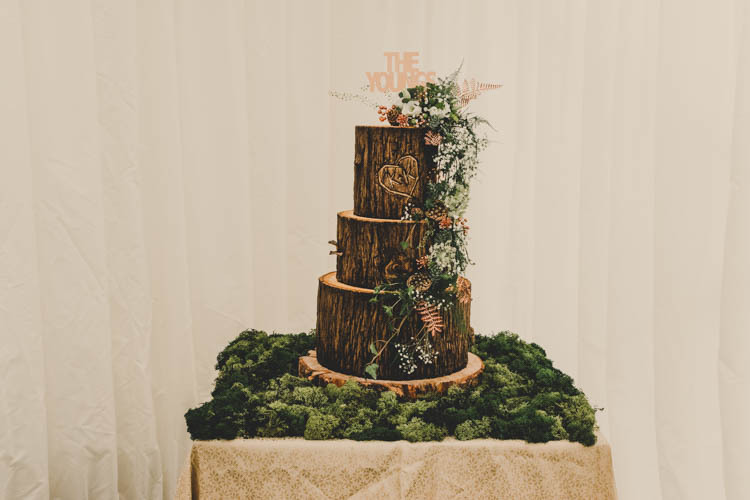 THE CAKE | The cake was designed by Vicki Smith known as The Cake Artist from Incredible Edibles. 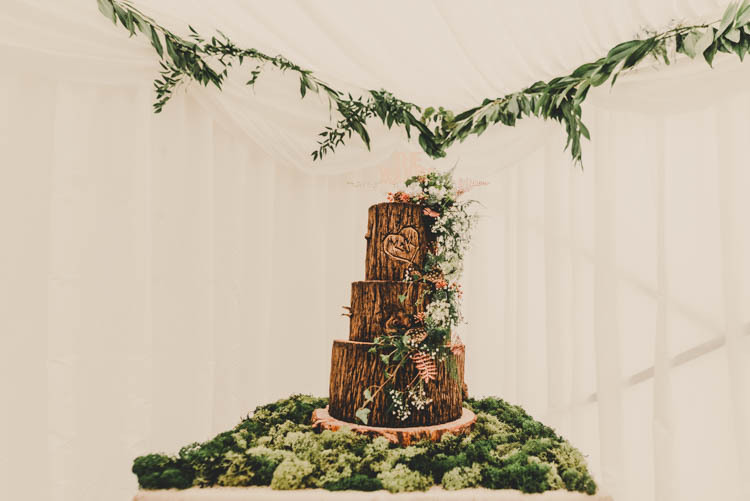 It was a woodland theme three-tier cake decorated in the style of dark logs, surrounded by berries and leaves on a bed of moss. People couldn’t believe it was actually cake! The cake was served as the dessert and so we had three decadent flavours of lemon meringue fluff with lemon curd, strawberry champagne and popping candy, and tropical rum Pina Colada. 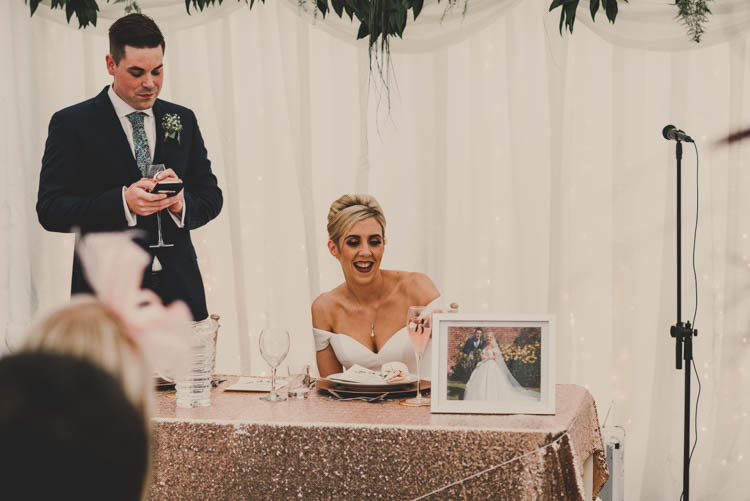 The cake was served as a platter so every guest was able to try each flavour. 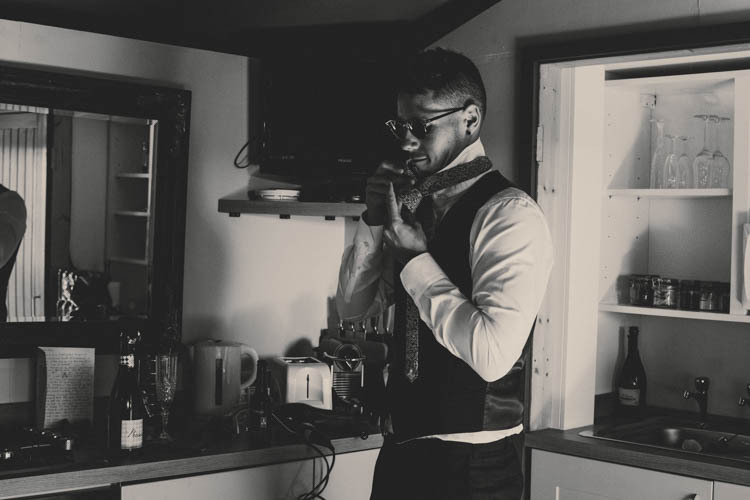 YOUR PHOTOGRAPHER | Jade Maguire. 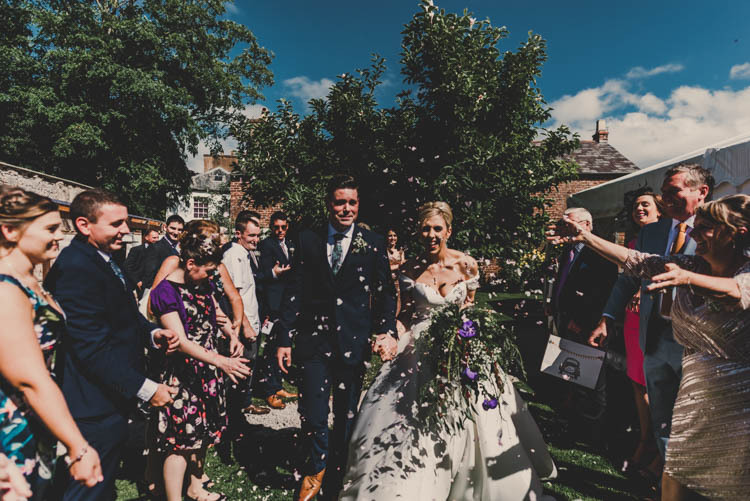 We wanted a documentary photographer who would really capture the day, rather than dozens of formal shots. 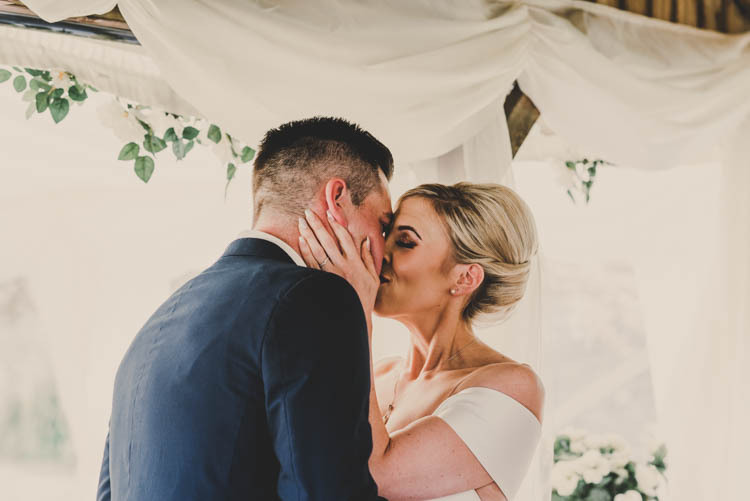 We chose a minimal number of family and couple shots so that Jade and the second photographer were able to take action-shots and capture the emotions. 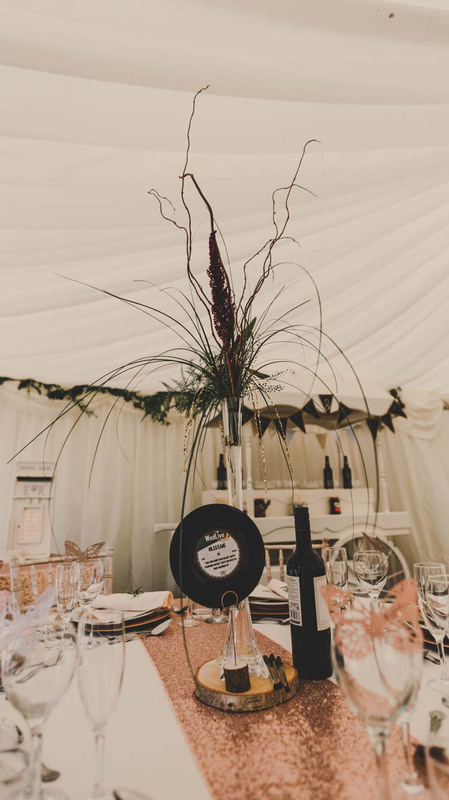 THE DETAILS & DÉCOR | The wedding party were invited to stay the night before at Pentre Mawr. We all met for a fizz reception followed by an amazing five-course meal and drinks into the night. The next morning the guests had breakfast together (although some had bacon butties in bed because of some sore heads!). 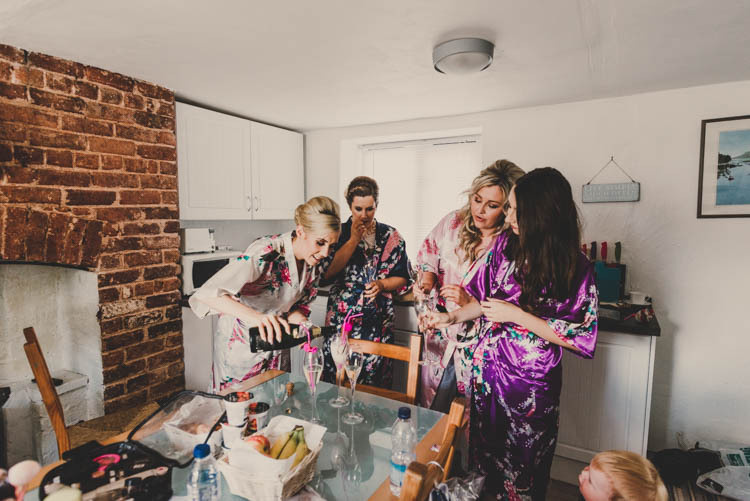 The groom got ready with his groomsmen and I was in the bridal cottage getting ready with my bridesmaids and the mothers. 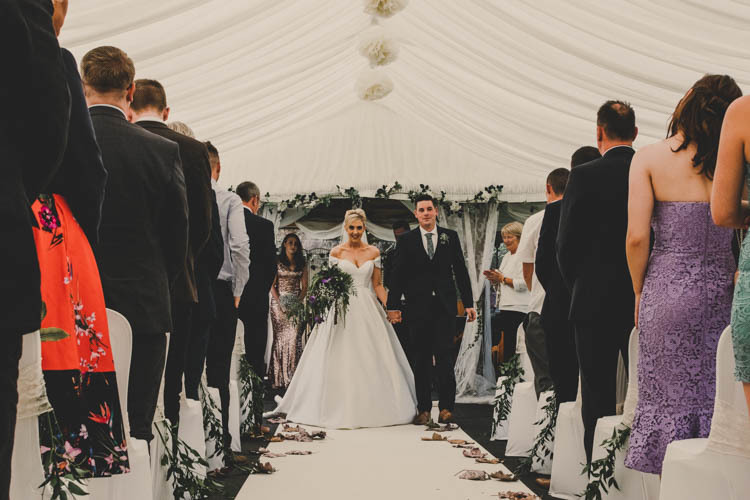 Other guests began arriving around 2:30pm for a 3pm ceremony and were greeted by The Clwyd Clippers singing songs in a barbershop style. 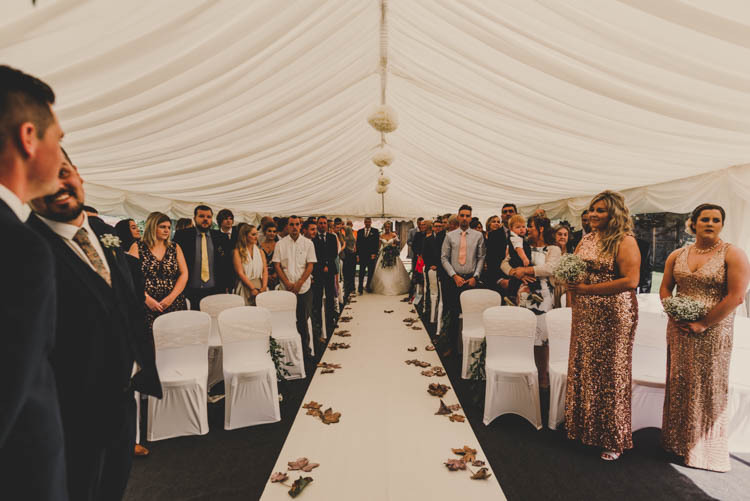 The ceremony marquee was located outside in The Secret Garden so didn’t need that much decoration – we added trailing foliage and cream lace ties to the chairs and a huge cream aisle runner decorated with rose gold leaves. We embraced the white and green and kept it simple. Straight after the ceremony we did the confetti walk and then stayed in The Secret Garden for prosecco whilst the Clippers continued singing and we had some photos. After the group photo (which Jade took from the roof!) 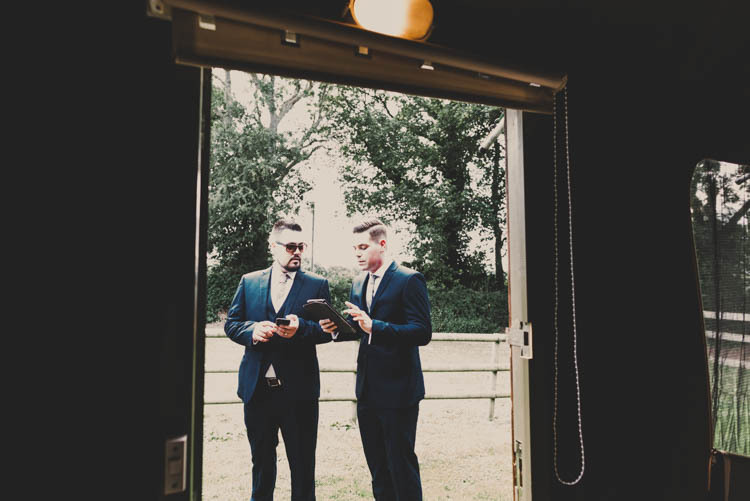 Karl and I went off on our “just married” golf buggy with a glass of fizz to spend some time together whilst guests moved to the wedding breakfast marquee. 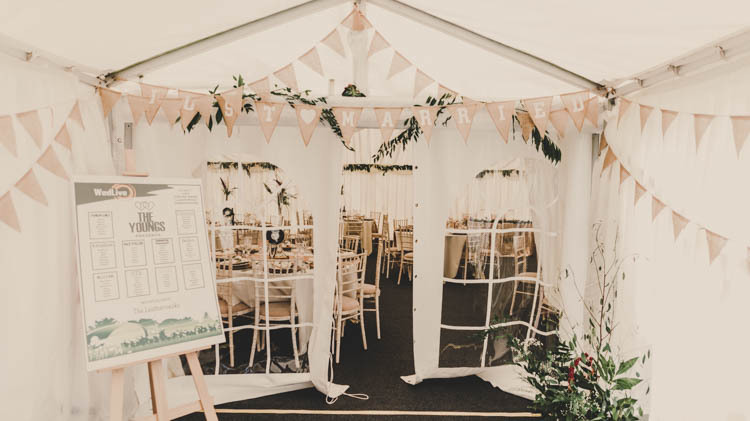 The wedding vreakfast marquee was a blank canvas. 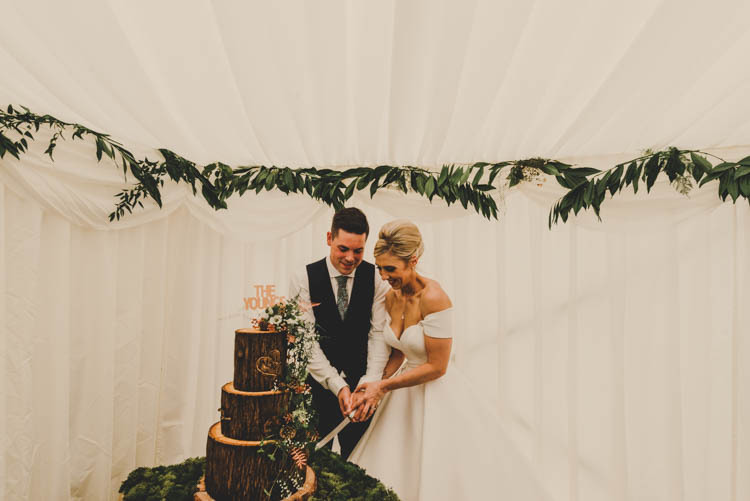 The florist added swathes of trailing foliage all around, the centre pieces were foliage and birch in tall ivy vases to give it the woodland feel, and we hired chiavari chairs to complement the rustic look. 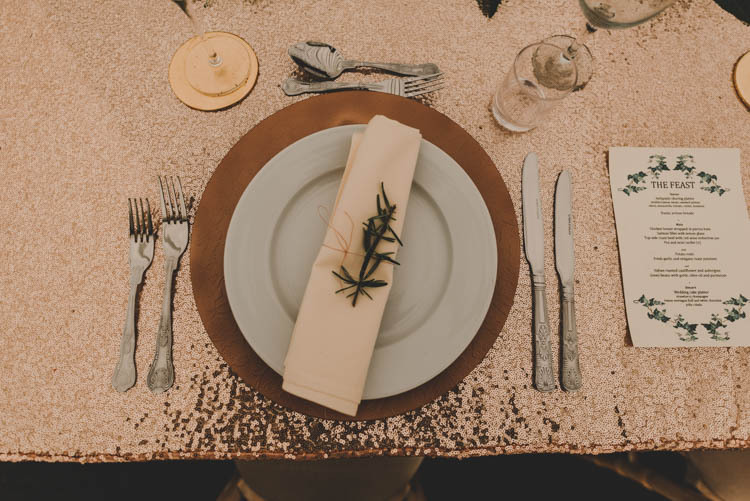 The glamour came from rose gold sequin table runners and rose gold charger plates. 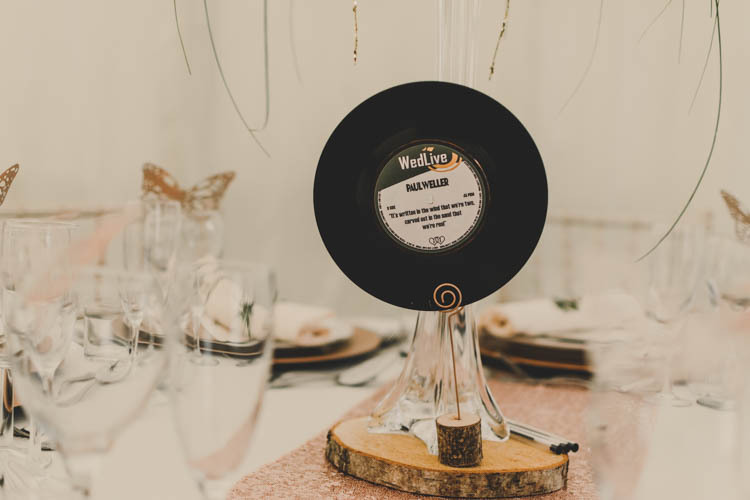 The table numbers were old 6″ vinyls which we had personalised with the details of our wedding and each table was named after one of our favourite bands. 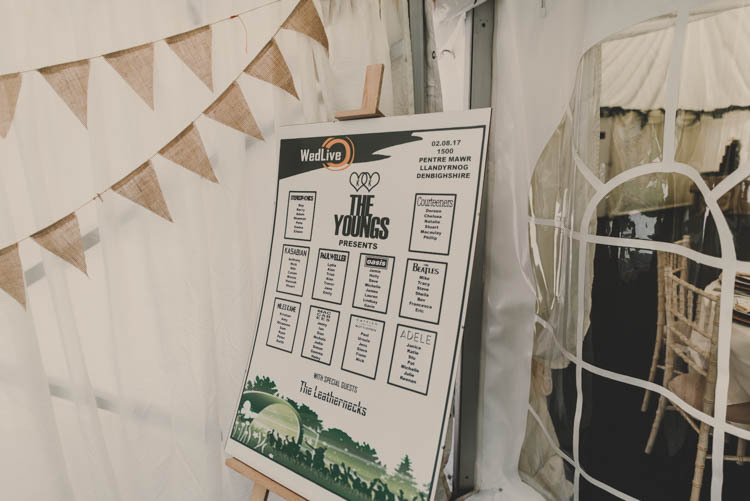 The seating plan was presented as a festival/gig format with The Youngs (us) as the main event and all the other tables were the supporting acts. We had everyone from Oasis to Paul Weller. 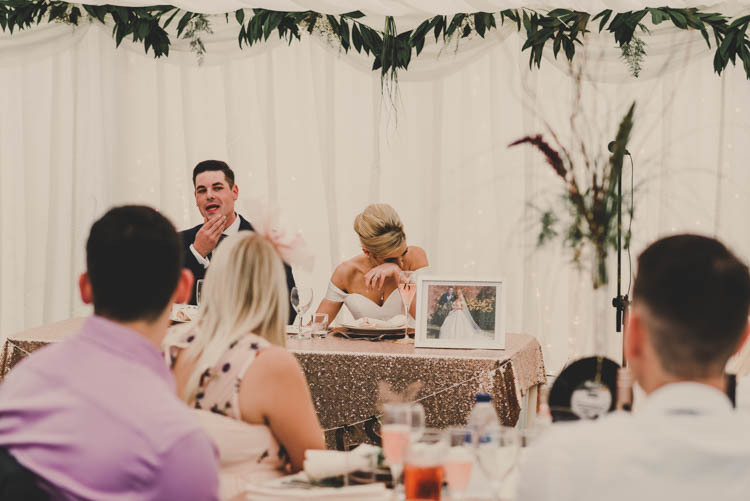 We chose to have a Sweetheart table instead of a top table because we wanted the wedding party to be able to sit with their partners and friends. 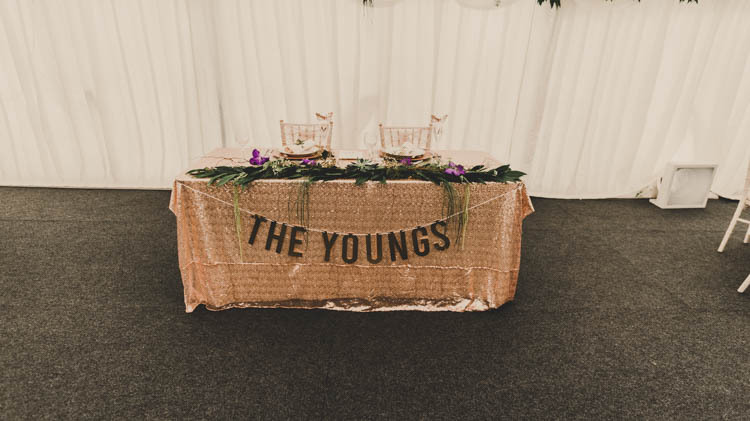 The idea of us being the main event was a theme throughout and we had ‘The Youngs’ signage in various places – a hanging banner across our sweetheart table, as our cake topper and the piece de resistance – a 25ft sign which lit up which was a surprise for our guests and only revealed once we went into the Barn to do our first dance. My dad made this completely from scratch and his only brief was “I want our name in lights like we are a band”. 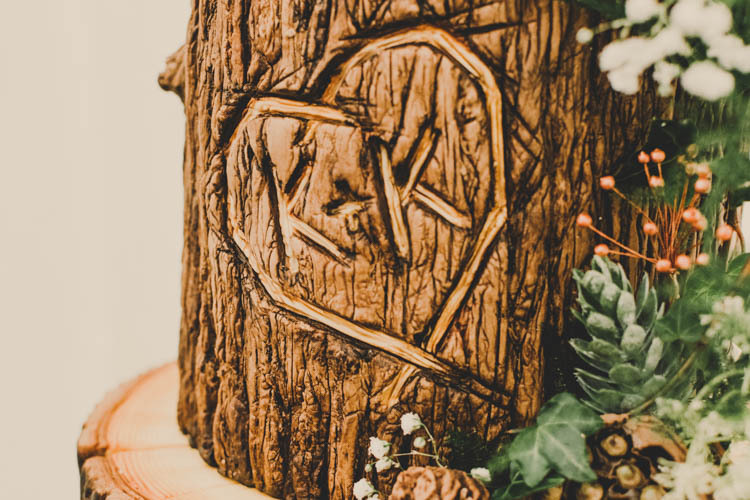 Some of the detail that made our wedding unique to us was the food, booze and music. We had a “sharing” theme when it came to the food – the starter was a Mediterranean medley sharing platter, we had “table chefs” who we had secretly decided as a surprise whose ‘job’ it was to carve all the meat we served (chicken wrapped in bacon, beef topside, and salmon) complete with a chef’s hat, and the sharing platter of wedding cake as described earlier. The caterers (who also did the bar), Dinners by Design were perfect for us as we got to completely design our own, unique menu. The music we chose throughout the day covered all our favourite bands from the 60s onwards – there was no cheese, or love song agenda – we played everything from The Smiths to Pulp to Florence and the Machine, in fact our entrance song was Kasabian and our first dance was to The Maccabees – Toothpaste Kisses (and we had dance lessons and learned a routine!). 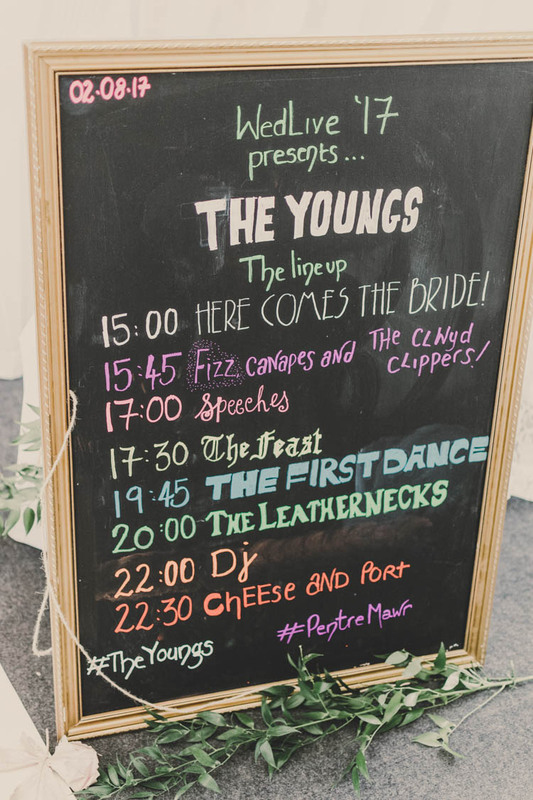 We had a band for the evening music, an amazing indie band who are a band in their own right called The Leathernecks who kept with the indie theme entertaining the guests with Arctic Monkeys, Catfish and the Bottlemen etc. 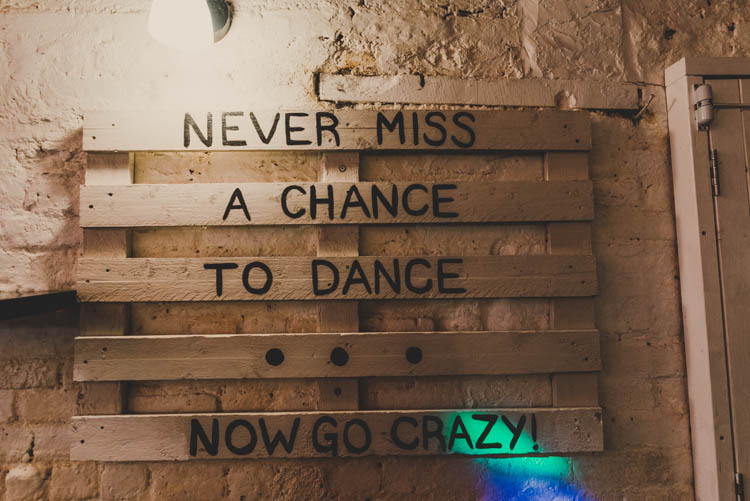 We then finished the night with a DJ who was under strict instructions to play no cheese although we had another secret – a half hour “rave” playing dance classics from the 90s onwards and had glowsticks for everyone to wear whilst they were raving. 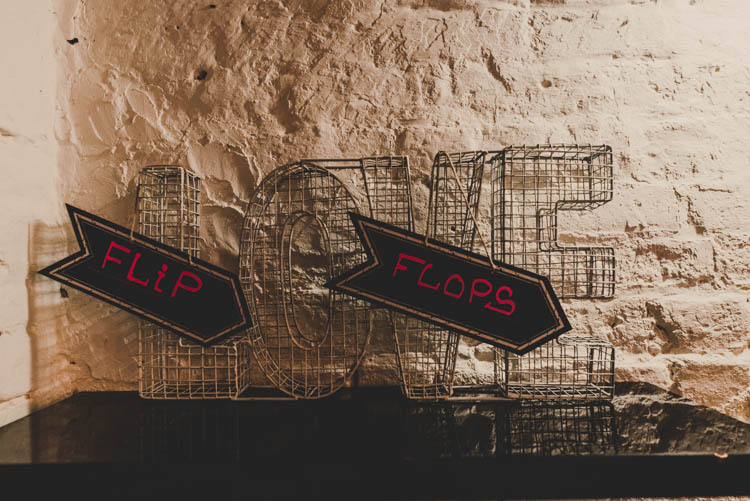 Other details included providing flip flops for guests once their feet got tired, a “cheese and port” station for when they got peckish late in the evening, and marshmallows for toasting and blankets by the firepits outside. Finally, the booze. 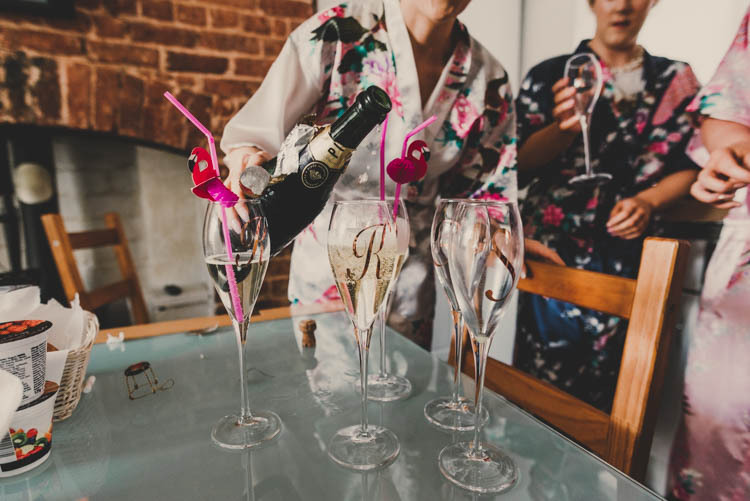 Guests were greeted with fizz and had wine on the tables, but it was actually really important to us we “thanked” our guests for the effort they went to, to come to our wedding (3-day wedding, mid-week, no kids…!) 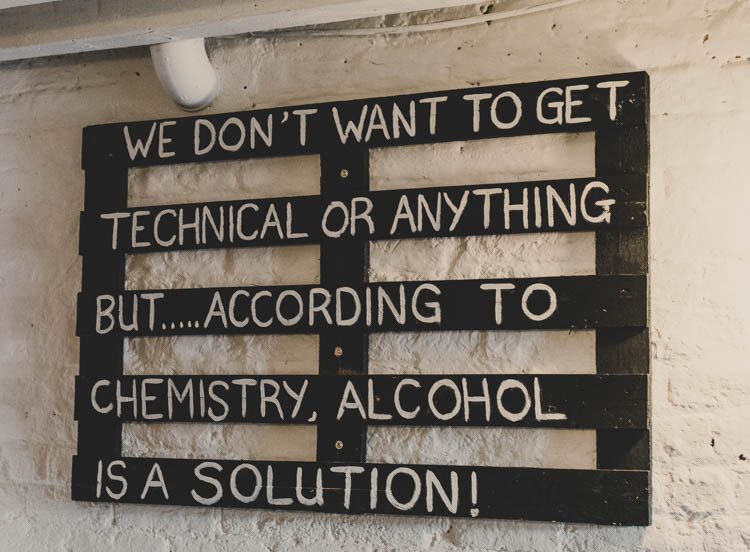 and so we had an open bar. 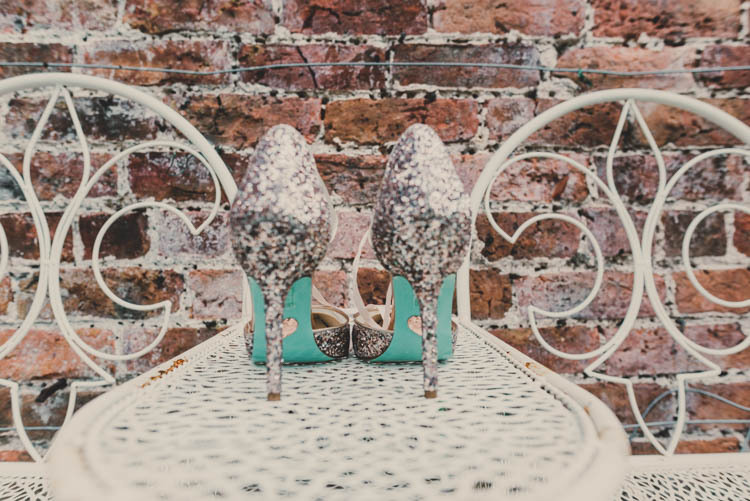 We didn’t tell guests, they were just told it was on the bride and grooms tab. It was definitely worth it. THE HONEYMOON | We went to Mauritius for two weeks the week after the wedding and stayed in the 5* Sugar Beach in Flic en Flac. It was luxurious, indulgent two weeks of eating and drinking like kings, sunbathing, relaxing and some sightseeing. We went on a boat trip and swam with wild dolphins, went VIP at the national Horse Racing event and hired a car for three days to travel the island seeing main sights such as the dormant volcano, a tea plantation, waterfalls, rum tasting and went hiking and quad biking. We had a hashtag #TheYoungsHoneymoon and kept everyone up to date! 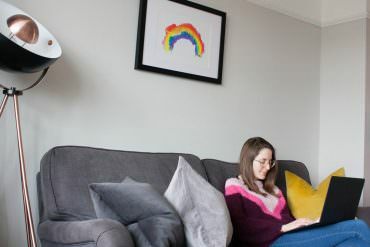 ADVICE FOR OTHER COUPLES | Stick to your guns – if you don’t want to invite children don’t be persuaded otherwise – just accept not everyone will be able to come. Decide your priorities early on and accept you will have to compromise. We knew venue, food, booze and music were the most important, so compromised on things like favours, expensive invites etc. 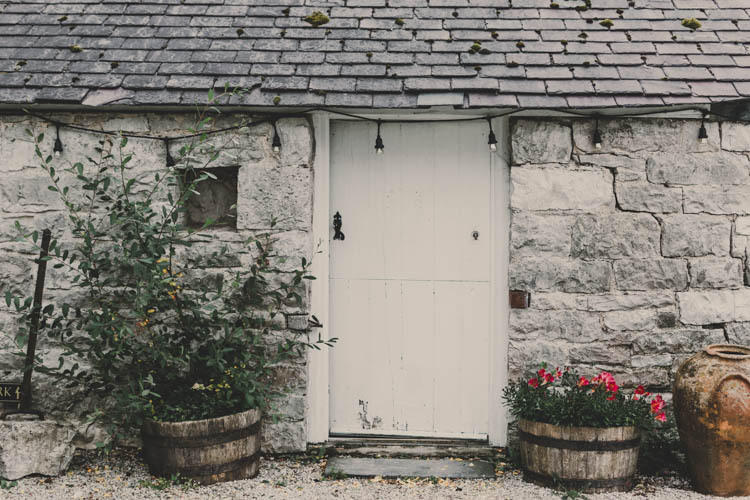 Do what makes you happy but don’t forget about your guests. 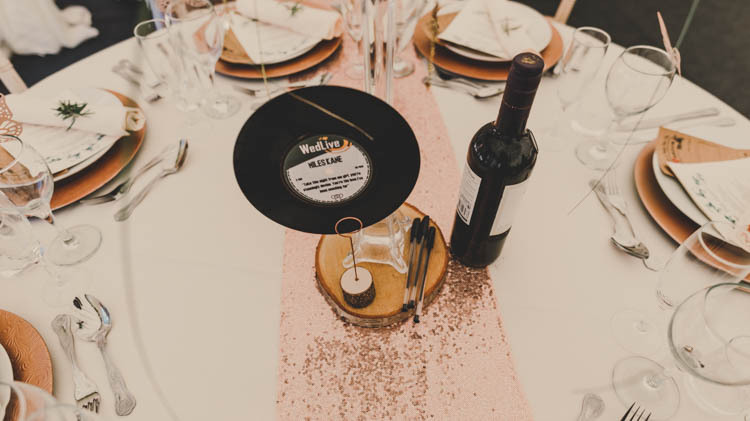 Some will go to a lot of effort and expense to be there and you want them to enjoy themselves – we made sure the food and music was “us” whilst thinking about our guests and everyone felt involved and catered for. We also invited plus-ones. 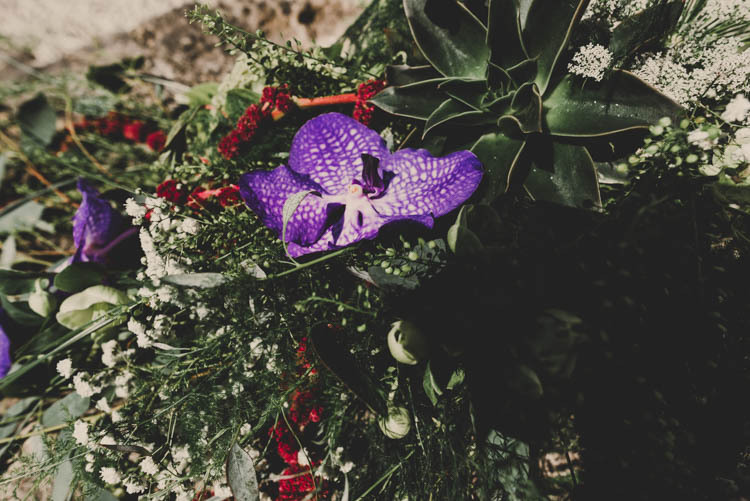 We decided that most people want to attend a wedding with someone and will probably enjoy themselves more if they do, so partners were invited, and where the person didn’t have a partner we gave them the option of bringing a friend. 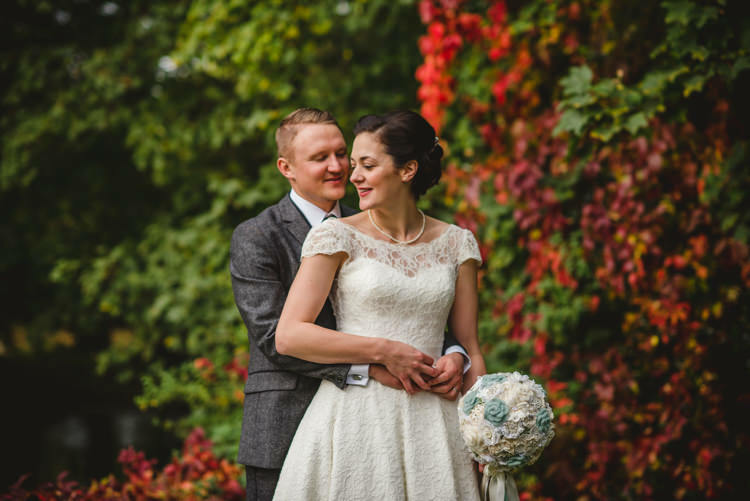 We kept it intimate though – 70 guests for the whole day (no evening guests).